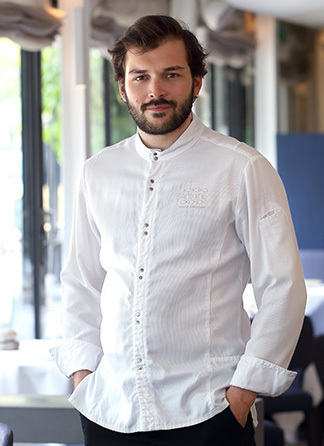 Originally from Lyon, Thibault Sombardier has always loved cooking since his childhood. He was already dreaming of becoming a cook when his dad brought him for the first time to Paul Bocuse's kitchens in Collonges-au-Mont-d'Or. He joined the hotel school of Orleans where he passed his CAP, BEP and his Professional Bac. He did his first internship in Vézelay, at Marc Meneau where he learned teamwork and rigor in cooking. 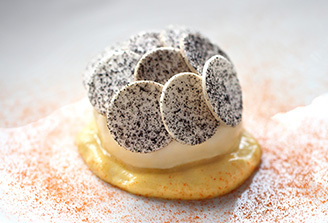 He then returns to Lyon in the kitchen of Chef Bernard Constantin as a clerk. He learns with him the real old-fashioned cuisine, game, meats, sauces ... Then under the impulse of Bernard Constantin who advises him to "learn to work the fish", he dedicates himself to this product which will become his favorite product. 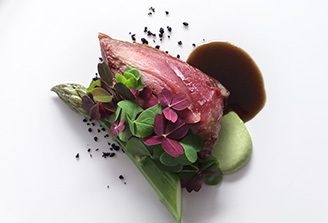 For two years, he joined what he called "three-star cuisine" before joining in 2011 Alain Dutournier who offers him his first position as Chef at Trou Gascon where he heads a brigade and takes responsibility for a restaurant. 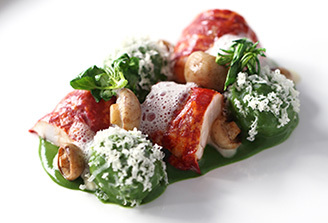 Today, he is proud to offer a pure and simple cuisine at Antoine, inspired by his encounters and his travels. Here, he endeavors to perfect delicate seasoning and original, subtle touches, where colors take a central position on the plate.